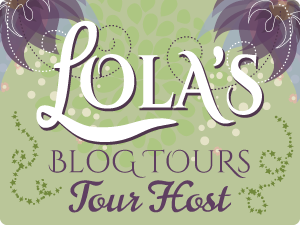 Aspiring scientist Arabella Holmes doesn't fit the role of a 1900s lady. Her father, Sherlock, landed her a position at the Mütter Museum to pursue her dream of becoming a purveyor of abnormal science, or what her father calls a "Boneseeker." Henry Watson’s two-fold mission at the Mütter Museum is to join their team of forensic anthropologists in unearthing unusual antiquities and to watch over Arabella. If only he could get her to speak to him, instead of hurling knives in his general direction. Assigned to a most secret expedition to investigate a mysterious skeletal hand discovered in upstate New York, Arabella and Henry are soon caught in a scientific debate, and the search for the truth may have deadly consequences for those involved. Are the bones from a Neanderthal? Or are they living proof of fallen angels known as Nephilim? Watson and Holmes must put aside their differences, trust their instincts, and rely on one another to survive to uncover the truth. I hear a bawdy laugh, and I wrench my eyes away from her earnest gaze, scanning the dance hall. I scan over the myriad of colors and gowns and faces and finally, I see her. My heartbeat bombards my ribcage. My hands are sweating. While they are in Priscilla’s hands. This is not normal. Not for me, anyway. I am dumbstruck. Arabella is so lovely I can scarcely breathe. She stands, hesitating at the top of the stairs, undoubtedly searching the crowd for familiar faces. My mind races back in time to my childhood and my parents’ parties. Bella could never tolerate crowds. I would often find her perched in a tree, party dress and all, or playing fetch with our dogs in the garden. She was better than Holmes, however, who would beg off each and every social function to which he was invited. If the gathering did not include science, crime, or deduction—there was no amount of Father’s cajoling that would convince him. I track her as she weaves in and out, finally appearing, hovering on the dance floor’s edge. Arabella had worn trousers, in secret, for as long as I could recall. But not tonight. Tonight is an Arabella even I have never been able to conjure in my wildest imagination. The ivory-silk dress is pulled tight around her tiny waist, and a green velveteen sash hangs to the side. A tassel drops provocatively at the bottom of the V in her décolletage. Her auburn hair flows around her shoulders in waves, unadorned. I walk in a straight line for Bella, my vision narrow as if I’m staring through a spyglass, and she is the horizon. She’s leaning against the wall, clutching a glass to her chest. Her eyes are pinched in distress, as if she’s enduring a flogging. Before, she was talking animatedly to Father, about work, no doubt. But now that he’s gone, she looks terrified and out of place once again. Her eyes jump like the staccato beats of the music behind me. I reach her and smile. Is it because of my presence? Am I being arrogant? Or hopeful. 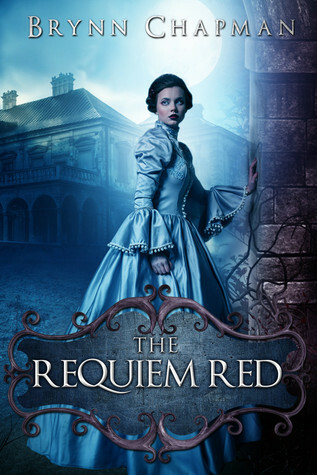 She extends her hand, which is covered in an elegant, ivory glove that reaches to her elbow. We share a very loud laugh, and for a moment, we are the only people in the room. Next to us a woman and her husband glare at our lack of decorum. “I’m so very glad you’re here, but I must admit I am shocked.” I lean in so she may hear me above the band. I notice the light sheen on her chest and her discomfort is my own; I yearn to alleviate her awkwardness. I step closer. Closer than society allows. “Dance with me.” My mind explodes with forbidden images. My mouth and body on hers. My hands tracing the line of her legs. I’m close enough to feel her breath. I laugh so loud, my father shoots me a death-by-dismemberment look from across the room. He eyeballs his cane, which conceals a short sword. I try not to laugh harder. Born and raised in western Pennsylvania, Brynn Chapman is the daughter of two teachers. Her writing reflects her passions: science, history and love--not necessarily in that order. In real life, the geek gene runs strong in her family, as does the Asperger's syndrome. Her writing reflects her experience as a pediatric therapist and her interactions with society's downtrodden. 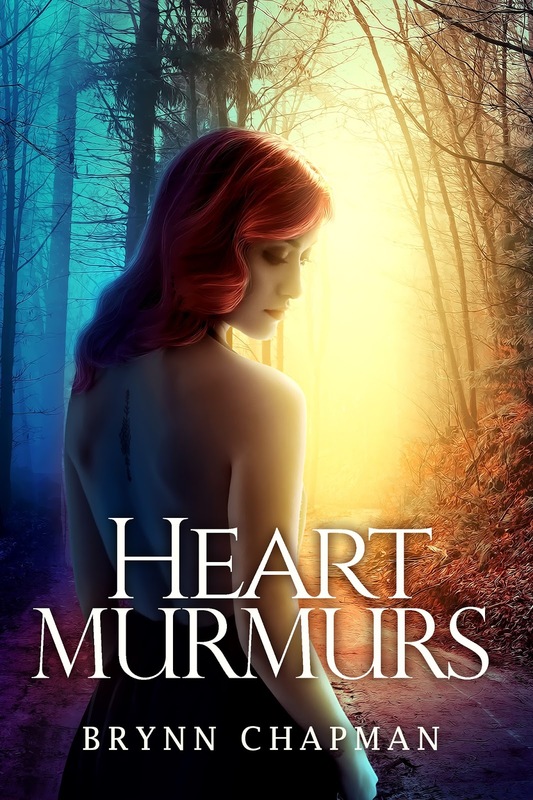 In fiction, she's a strong believer in underdogs and happily-ever-afters. Her ancestry tree claims she's a descendant of the House of Stuart. Be sure to watch for Promo videos from Brynn’s PR guy—pictured below. Here’s a sample of the insanity on Facebook. 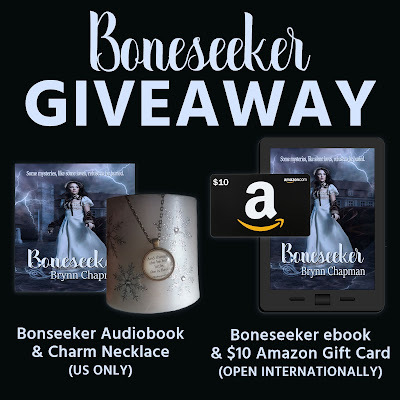 GIVEAWAY #1: To enter to win a BONESEEKER audiobook and the pictured charm necklace ("And though she be but little, she is fierce." - Shakespeare), send a copy of your kindle purchase of BONESEEKER to publicity.brynnchapman@gmail.com. US only. 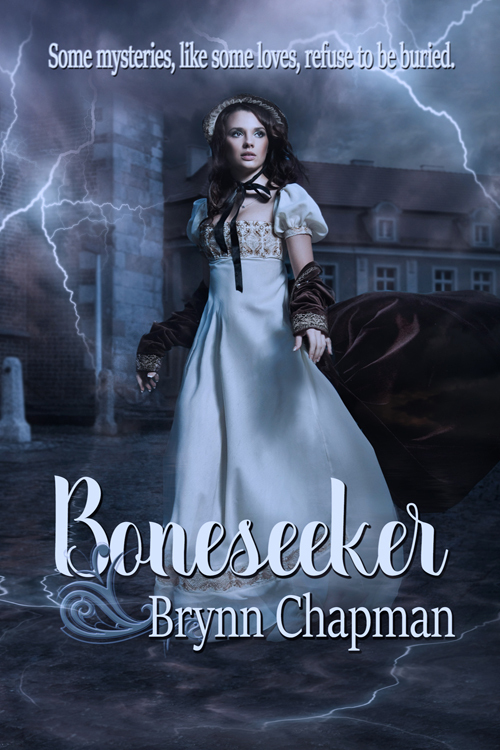 GIVEAWAY #2: To enter to win a BONESEEKER ebook and a $10 Amazon Gift Card, enter via the Rafflecopter below. Open internationally. Ends January 24th.